Tulo was injured last year, but now he’s healthy. When he’s playing, he’s the best shortstop in fantasy baseball. He will hit around .300 and can hit 30+ homers. He also scores and drives in a lot of runs. He’s not a first round pick, but he’s definitely the number 1 shortstop. Reyes is a great player. He steals a lot of bases, scores a lot of runs, hits for good average, and can even hit a good amount of homers. He used to be a 1st round pick, but he’s falling lower than that now. He still has the upside to be as good as almost anyone fantasy wise. Take him in the early rounds, and hope that he performs like a 1st rounder. Hanley used to be the easy choice for first player drafted in fantasy baseball. After one injury plagued season and one off year, his value has greatly fallen. I wouldn’t be surprised if he bounces back this year, though. At the weak shortstop position, he’s still a top 3 option, but he has the ability to be number 1. He’s slightly more valuable at shortstop than he is a 3rd base, but he should be a starter at either position. Take him around the same time as Reyes. As hard as it is to believe, Rollins is still one of the best options at shortstop. He still steals a lot of bases, and he hits a lot of home runs. Yes, he’s getting older, but when he’s on the field, he still performs. He isn’t as good as the top 3 options, but he’s the next best. Desmond is one of the best options at shortstop. He hits for a good batting average, steals a lot of bases, and hits a lot of home runs. He’s still young, so he can improve in all of those categories. He is a top 5 option at short. Zobrist is a pretty good option at either second or short. Both are weak positions, and he’s eligible at both. He hits 20+ homers a year which is good enough to make him a solid starter at either position. Andrus is a good choice as your starting shortstop. He hits for a high average, scores a lot of runs, and steals a ton of bases. Shortstop is a very think position so Andrus may end up top 5. Castro is a good player. He hits for a high average, steals a lot of bases, and even has some pop in his bat. He’s good enough to be a starter. Take him after the better options are off the board. Danny Espinosa is a pretty good option at either second base or shortstop. He hits around 20 homers a year and steals 20 bases as well. He should be able to improve on both of those things as well as bring up his batting average. You should be happy if you can grab him late as your starting second baseman or shortstop. Jeter hits for a high batting average and has some power, but he isn’t the greatest option at shortstop. He’s good enough to be a starter, but he doesn’t have much upside. In fact, he could let his age finally catch up to him and play horribly. Assuming that doesn’t happen, Jeter will hit at least .300 and hit 10-20 homers which makes him a solid option at short. Alexei is usually a pretty good shortstop. He has a good combination of speed and power. His power numbers weren’t really there last year, but they should be back. He’s in around the same category as Jeter. Cabrera isn’t that great, but he does have some power. He can hit 20+ homers which at the weak shortstop position, is hard to come by. There are still better options out there though, and you should try to take one of them. Hardy is only on this list because of his power. He should be able to get 20+. He’s similar to Cabrera. It’s not that bad if you end up with him, but try for better. Escobar is only on this list because he has speed. He can swipe a lot of bases, and he could hit around .290 as well. Much like Hardy and Cabrera, only take him if you have to. You could do better. 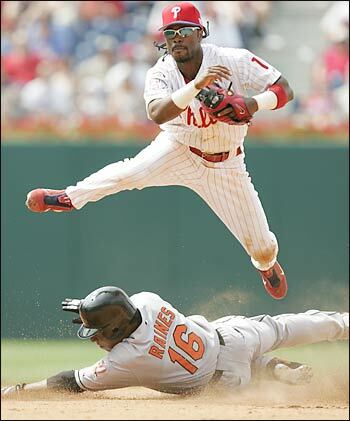 Drew used to be a good shortstop. He was able to maintain a pretty good batting average and hit 15, sometimes even 20, home runs. He’s been injured the last few years, but he’s now the starting shortstop in Boston. Maybe he could bounce back. Nakajima is playing is his 1st season in the major leagues after playing in Japan his whole life. He will be the starting shortstop in Oakland. He was pretty good in Japan and hopes to be just as good in the major leagues. Nobody knows how good he will be here, but he could end up surprising people.